Use CustomizerGod. 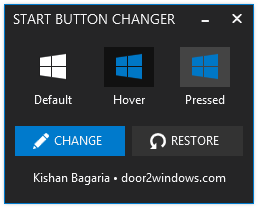 Windows 8.1 Start Button Changer is obsolete, will no longer be updated and can cause problems. CustomizerGod is way more stable, fast and safe. 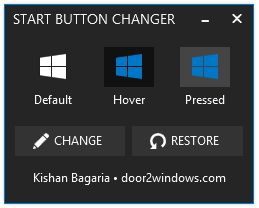 Windows 8.1 Start Button Changer is a freeware from door2windows which lets you easily change the start button in Windows 8.1. Browse and select the image which you want to display as the new start button. The app will automatically resize the image for you so it is not necessary for the image to be of specific dimensions. You can get start buttons here. Click Open. 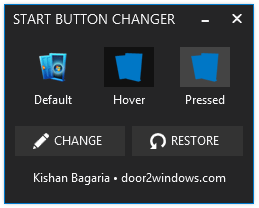 Windows Explorer will restart automatically and the new start button will be displayed. 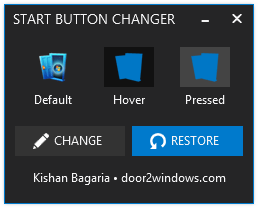 To revert to the original start button, click the Restore button. 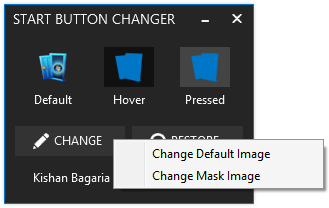 Right-clicking the Change button will provide you the options to change only the default image or only the mask image (hover and pressed).